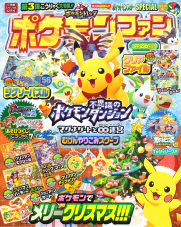 Pokemon Fan is a magazine centered entirely around Pocket Monsters. 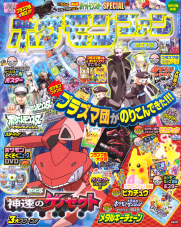 This periodical, released every three months or so, consists of multi-page spreads that offer previews of upcoming episodes of the TV series, updates on any new games that may be coming up, and information on new products that are about to hit store shelves. 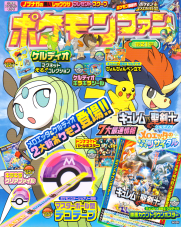 Each issue usually comes packaged with small items like pencil cases, Pokemon Battrio pucks, and keychains. 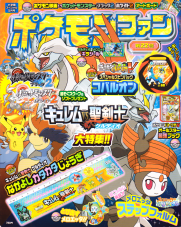 The cost of an issue of Pokemon Fan varies from issue to issue but usually hovers around the 800 yen range. 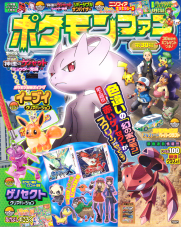 The magazine first started publishing Pocket Monsters Special BW Version in its fourteenth issue. 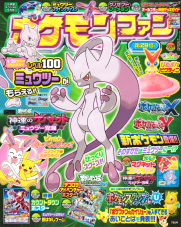 You can check out the magazine's official website here. 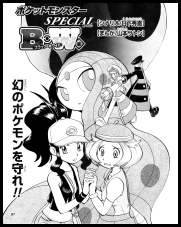 "Lost in the Big City"
"The Mystery of the Missing Fossil"
"A Direct Attack and a Daunting Defense"
"Battle on a Roller Coaster"
The trainers Black meets in the Fukiyose Cave are Shohko (ショーコ) and Hime (姫), or "Princess." 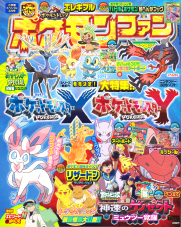 There is a trainer named Shouko (ショウコ) on Route 14, but she doesn't have the same pokemon that the Shohko in Pocket Monsters Special has. This trainer was renamed "Ace Trainer Junko" in the English version of the games. "Princess" orders her Kuitaran to attack, but a third legendary pokemon, Cobalon, appears and knocks them back. Suddenly, one of the torches Princess was carrying causes an explosion! 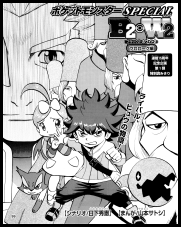 One of Shohko's Minezumi is trapped in the blaze, so the three pokemon immediately get to work. Virizion runs through the flames and picks up the startled pokemon, Terrakion charges into a nearby wall to create an opening for everyone to escape, and Cobalon smothers the remaining flames by smashing a boulder. 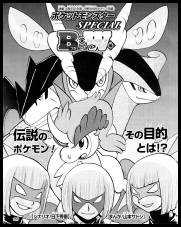 Once outside, the legendary pokemon surround the two girls' pokemon and take them away! Just then, Araragi-Hakase's father and Iris appear and tell everyone about how the trio doesn't trust humans because of the terrible things they've done in the past. Black, with the help of Musha, tracks down the trio and confronts them. He explains that the two trainers care about their pokemon very much and that their pokemon, in return, want to be together with them. After silently conferring with each other, the trio releases their prisoners and disappear. As Araragi-Hakase wonders whether or not his words really got through to them, Black realizes that he never actually got around to capturing any of the legendary pokemon. Princess' real name is confirmed to be Trish (トリッシュ). A bourgeoise with the same name can be fought in Sazanami Town in the games. In Kanawa Town, White shows just how much she's grown as a battler by nearly defeating the Subway Master Nobori. Suddenly, White's pokemon team - which now includes a Maggyo, Uniran, and a Mamanbou - begin to wander away as if in a trance! White follows them and finds that music being performed by Bel is what drew her pokemon away! As the two catch up, Bel tells White that she's upset at not finding a purpose to her journey the way her friends Black and Cheren have. To cheer her up, White takes Bel to Hiun City. Once there, White leads her to a cafe on Slim Street and tells Bel that she wants to introduce her to a guitarist who performs there. When they go inside, however, they find the venue's been wrecked by a Vulchai! The guitarist explains that the Vulchai has been tearing up the place trying to go after the legendary pokemon Meloetta! After White spots Meloetta clinging to a chandelier for dear life, she sends out her Maggyo to fight but is quickly defeated. At that moment, Bel grabs a guitar and becomes determined to do whatever she can to help. From doro (泥), or "mud." Most likely from Amanojaku, the Ability known as "Contrary" in the English versions of the games. Special thanks to 捷克羅姆 over at Bulbagarden for the translation assistance. 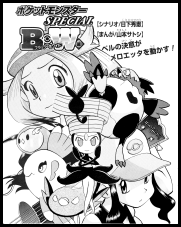 The guitarist hands Bel the sheet music for "Ancient Song," a song whose melody Meloetta has forgotten. After practicing for some time, Bel is able to play the song, which in turn enables Meloetta to recall how it goes and start singing it all by itself! Meloetta's voice knocks the Vulchai back, so it calls on its fellow Vulchai to come and help it out. Suddenly, four more Vulchai burst into the cafe! Meloetta responds by changing into its Step Forme and makes quick work of the flock of pokemon with its powerful Fighting-Type attacks. When the fighting's over, White throws a Monster Ball at the boss Vulchai and captures it! Later, Bel calls Araragi-Hakase and tells her that she's decided to become her lab assistant. When the professor complains that they've finished repairing her Pokemon Zukan and that her father has already left to go deliver it to her, Bel tells her to have him give it to White instead. Some time later, White receives a Pokemon Zukan from Araragi-Hakase's father and records Meloetta's information. Now that Bel's figured out the purpose to her journey and Meloetta's safe and sound, White prepares to leave for her next adventure. White's Vulchai is nicknamed Barbara (ばーばら). In Hiougi City, a young boy named Hugh picks out a Choroneko to give to his kid sister for her birthday. He later presents her with the pokemon and is amazed at how quickly it takes to her. Meanwhile, G'Cis addresses the members of the Plasma-Dan who have gathered at their headquarters. 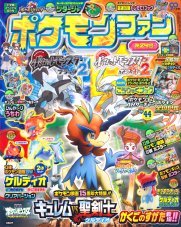 He also gives the members of the Seven Sages their orders; Sumra will spread the Plasma-Dan's message, Azul is to find information about the legendary dragons, Ryokushi is told to research the desert near Hiun City, Giallo is asked to find out about the Kami trio, Rot is told to research Victini, and Vio and the Dark Trinity are told to help out in other ways. Back in southwest Isshu, Hugh presses his sister to have a pokemon battle with him. They go out to Route 19 and spar for a bit until two members of the Plasma-Dan show up and tell them that they'll "liberate" their pokemon for them! Hugh and his sister try to fight back, but the grunts overpower them and manage to leave with Hugh's sister's Choroneko. Beaten and humiliated, Hugh promises that he -will- become strong enough to pay the organization back for what they've done. 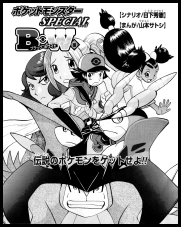 To commemorate Pocket Monsters Special's fifteenth year, Pokemon Fan interrupted the BW chapter to run this prologue to the B2W2 Chapter. The legendary pokemon Virizion, Terrakion, and Cobalon all think back to their encounter with Black. Virizion and Terrakion are convinced they can start trusting humans again, but Cobalon refuses to forgive them for all the suffering they've caused. Suddenly, Cobalon senses an unfriendly presence and fires a beam at it from its forehead! After a terrific explosion, the Dark Trinity jumps out from its hiding place and rush toward the pokemon! Cobalon uses Metal Burst to retreat, givng the Dark Trinity no choice but to give up capturing them. Later, the legendary pokemon meet up with a young Keldeo near Sangi Town to see how its training is going. As Keldeo works on perfecting its "sword," Cobalon wonders where the Dark Trinity ran off to. On a laboratory in an island not far off, the Dark Trinity watch as the organization's newest creation tests outs its power. Suddenly, the Sanyou City Gym Leaders - Dent, Corn, and Pod - appear in the lab and challenge the Dark Trinity to a battle! As the three on three battle in the P2 Lab begins, the four legendary deer pokemon head toward the island to put an end to the Plasma-Dan's evil plans. The Sanyou City Gym Leaders and the Dark Trinity are revealed not to be the same people despite all the hints to the contrary. 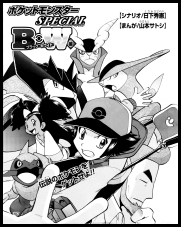 According to the official website, this is part one of a two part story that's meant to tie the events of the Black & White chapter to the B2 W2 chapter. As the battle continues, the Sanyou Gym Leaders tell the Dark Trinity that they followed them to the P2 Lab to see what they're planning. Additionally, they managed to pick up evolutionary stones along the way! As their newly evolved Yanakkey, Baokkey, and Hiyakkey begin to fight back, Keldeo and the others arrive at a cliff overlooking the lab. Keldeo observes that while the Dark Trinity's pokemon are stronger, their battle is driven by the fear of what their trainers will do to them if they lose. The Sanyou trio's pokemon, on the other hand, know that they are loved by their trainers and are genuinely enjoying the battle. The four legendary deer pokemon decide to help the "good humans" by using their "swords" to defeat the Dark Trinity's pokemon. 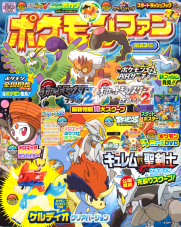 Later, Cobalon commends Keldeo on its battle but adds that it'll need to have "resolution" if it wants to become stronger. As the Dark Trinity retreat, they mention that their research on returning the Kami Trio to their "reijuu" forms is now complete. The legendary pokemon also depart, leaving Dent, Pod, and Corn behind to declare that they'll step down as Gym Leaders so they can focus on becoming stronger. Despite being featured on the title page, N, G'Cis, the Goddesses, and the Seven Sages do not make an appearance in this chapter. 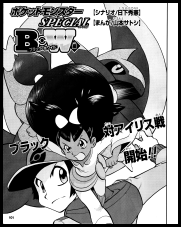 The Isshu League continues with a three-on-three match between Black and Iris! As Iris' Onondo is attacked by Black's Wargle, it evolves into Ononokusu! Iris says that she knew it was about time for it to evolve since it's been fighting so many tough battles lately. Black, knowing that he'll lose if even one of his pokemon is knocked out, switches out his Wargle with Dentula. Likewise, Iris sends out her Crimgan. As the two pokemon fight, Iris thinks back to her time in Fusube City, aka the Village of the Dragons, and how she first met Shaga and Adeku. She then reveals that her ultimate goal is to become the Champion and defeat N so she can avenge her mentor's defeat. Black doesn't let up and sends out his Protoga, so Iris sends her Ononokusu back out to counter Protoga's Hard Rock Ability. As Ononokusu swings at its opponent with its sword-like fangs, Protoga use its powerful jaws to catch them and then deliver a devastating Ice Beam at point blank range! 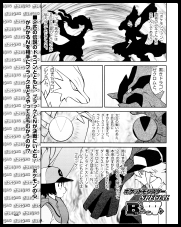 After Iris' pokemon is knocked out, Black approaches Iris and tells her that she doesn't have anything to worry because he also wants to take down N.
The battle between Black and Reshiram and N and Zekrom begins! As Black wonders why Reshiram keeps ignoring him and just does whatever it wants, Araragi-Hakase's father approaches Black and updates his Pokemon Zukan for him with newly gathered information about the legendary dragon duo. Thanks to this update, Black finds out that Zekrom and Reshiram both have signature attacks that become more powerful when launched immediately after the other's. He then turns to his partner and decides that it's a waste of time to fret over the whys and hows of him being chosen as the "Hero of Truth" and should just focus on working with Reshiram to win this battle instead. Just then, Zekrom goes into Overdrive mode and fires off a Cross Thunder, giving Black a glimpse of exactly how these signature attacks work. Black knows that Reshiram will go down if it's hit one more time, so he has Reshiram wait to fire off its Cross Flame attack immediately after Zekrom's Cross Thunder. Reshiram leaps out of the way just as its powered-up Cross Flame attack hits its target, knocking Zekrom to the ground and knocking it out! Has Black really become the "Hero of Truth?" G'Cis approaches the now victorious Black and announces that N is his son! The chief of the Plasma-Dan's Seven Sages continues by stating that his plan was to gain the people's trust by displaying the organization's overwhelming power and therefore earn them the authority needed to convince those who haven't liberated their pokemon yet to go ahead and do so. They can't allow a single person to be seen as stronger than them, however, so G'Cis says that Black will have to be eliminated. Reshiram is too tired to fight back so Black calls on his other pokemon to battle G'Cis. 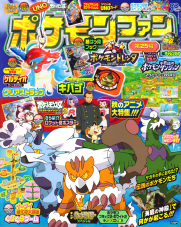 However, the pokemon in G'Cis' party - Sazandra, Shibirudon, Gamageroge, and Deathkan - were all chosen specifically to fight against the trainer who's gotten in the Plasma-Dan's way so many times before! 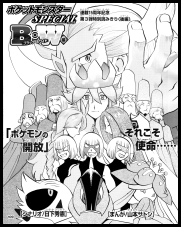 Black has his Musharna eat his dreams to help him see that a fifth pokemon, Ulgamoth, has been giving the others support from out of sight. Once that pokemon's flames are stamped out, Black has his team defeat G'Cis' pokemon in one massive melee attack! As G'Cis runs away, Black has his Protoga trap him with a Stone Edge attack! Is this the end of the Plasma-Dan?